As promised in an earlier post, here are some of the Ikebana (floral arranging) works I saw at the exhibition that also had the preschooler ikebana I posted about the other day. 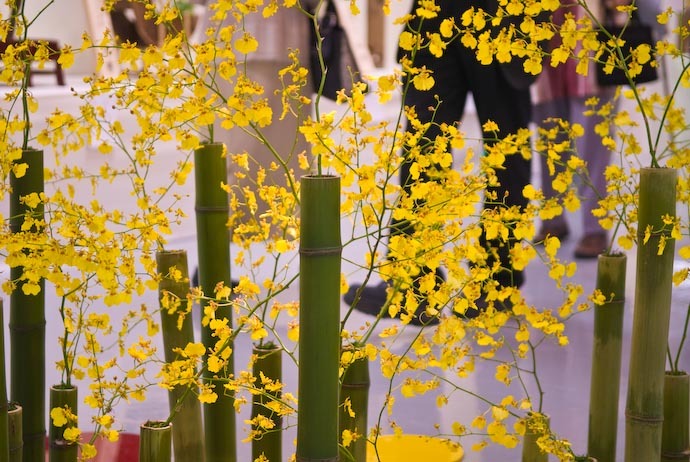 If you know the slightest thing about ikebana, you'll probably cringe at the total lack of understanding evident in my comments, so you have my apologies up front. Based on how they were presented, the three works above were clearly by important and/or well-respected people. The middle and right-side nameplates indicate that they were done by the heads of schools (although I'm not sure whether “school” here is in the sense of a place of study, as in “school of thought,” or both). The photo really does not do it, or any of these, justice. I suppose the same could be said for a photo of a painting or of a statue: such photos convey the intellectual appearance, but fail completely to convey any greater artistic sense. At least, that's the case with my photos. The photo above makes the arrangement look pedestrian, when it was really exceptionally well balanced. To put it another way, it just made you feel nice to look at it, but I can't same the same for the photo. As I said, there must have been hundreds of arrangements on display, in several large rooms. I had only a short time, made shorter by Anthony being a bit fussy (until Arthur looked after him for a few minutes, thanks! ), so I really didn't have time even to enjoy them all, much less photograph even a representative sample (and what I did photograph was under conditions that we'll generously call “less than ideal”). To head off the inevitable question about the lady left-of-center wearing a face mask, it's common in Japan to wear such a mask when you have a cold so that you avoid passing it along to everyone. It's a basic courtesy that the rest of the world would do well to adopt. The arrangements on the table in front of them all seem to use non-traditionally shaped vases, which is perhaps avant-guarde as well? 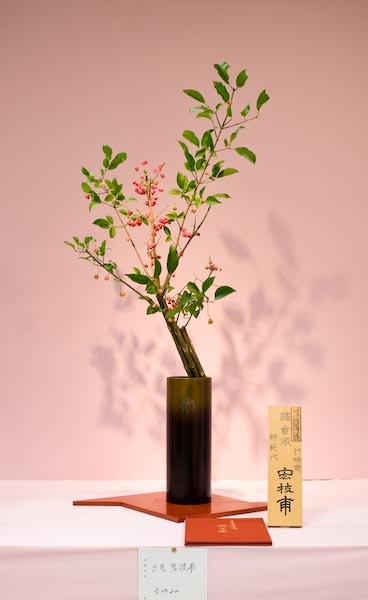 Another one that I liked, from the same group as the witch hazel and Japanese rowan, is an arrangement of mayumi, 真弓 (Japanese spindle, which yes, I had to look up). 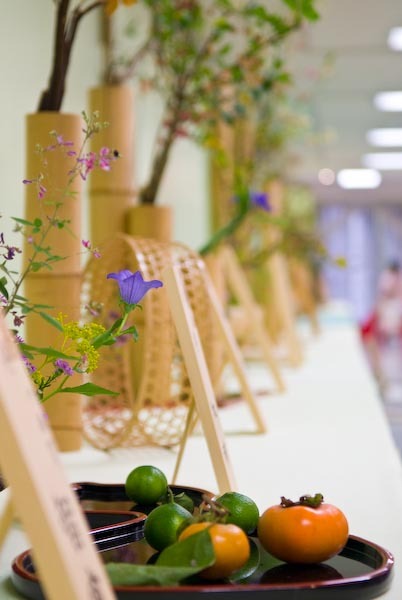 As I said in the previous post, Ikebana is an art with over a thousand years of history and refinement that is lost on me. But pretty is pretty, and there was plenty of pretty on display, so I wished I could have stayed longer. Really enjoyed this set of ikebana photographs. The appeal may not always be instant, but they do make me want to keep looking again. By the way, in case anyone thinks that’s not a witchhazel (mansaku), they’re right. Mansaku is Japanese witchhazel, Hamamelis japonica, but I believe this is Disanthus cercidifolius (maruba-no-ki or beni-mansaku). It’s a lovely and unusual shrub in Western gardens, related to the witchhazels (same family, different genus). 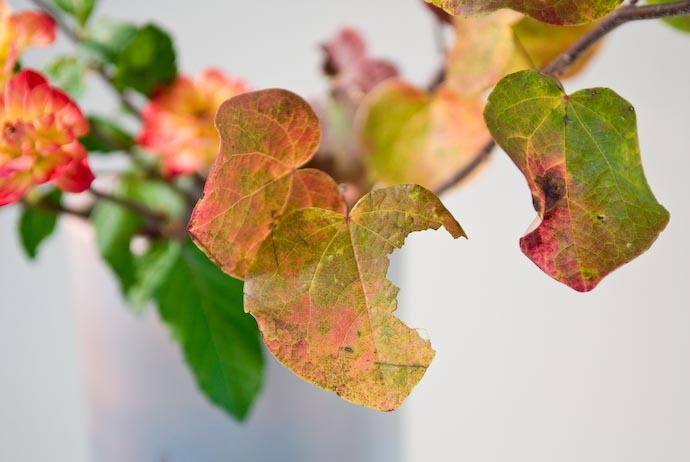 Apart from the very different leaf-shape it has maroon flowers with 5 petals in late autumn, rather than the 4-petalled yellow to orange early-spring flowers of Japanese and Chinese witchhazels. Having seen (seldom enjoyed!) a lot of competitive flower-arrangement exhibitions in the UK, e.g. at Chelsea Flower Show, I have to say that this ikebana exhibition blows them out of the water for style and presentation: wonderful! Thanks for another fascinating post. Great pics of the Ikebana. Come check this site out for some more pics and a forum. I cannot be sure, but this sounds to me like a reference to the actual Schools of Ikebana, in which case, “school” is in the sense of both a place of study and school of thought, or more like style. 🙂 From what I understand, the schools of Ikebana are both physical places where you can formally learn Ikebana, and thusly, also ways to describe differences in styles of arranging. Each school has a headmaster who can trace the school’s history back to the founder. 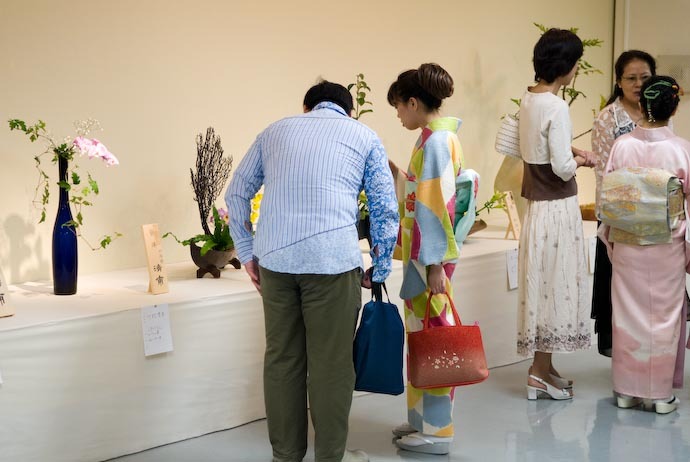 I don’t know for sure if this indicates that the displays above are from true Schools of Ikebana headmasters or the heads of particular chapters of a school. This is because a school name when referencing a place of study does not necessarily describe just a single location; there can be chapters of different schools all over the world. We have both Ikebana and tea ceremony school chapters here in Philadelphia (http://www.ikebana-philadelphia.org/ and http://www.phillytea.org/). It is the same concept as Japanese tea ceremony schools – there are three main schools (san-Senke) in Japan, each with a few differences in technique, and you can find chapters and variations of those schools all over the world. 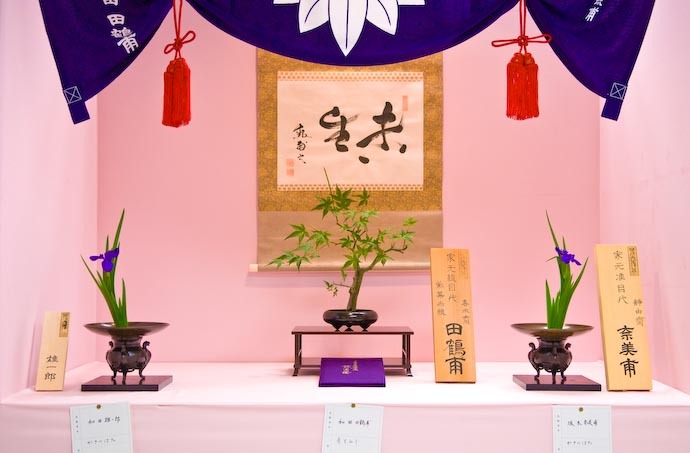 Depeding on which school you go to, you are said to practice that type or style of tea ceremony/Ikebana (i.e. 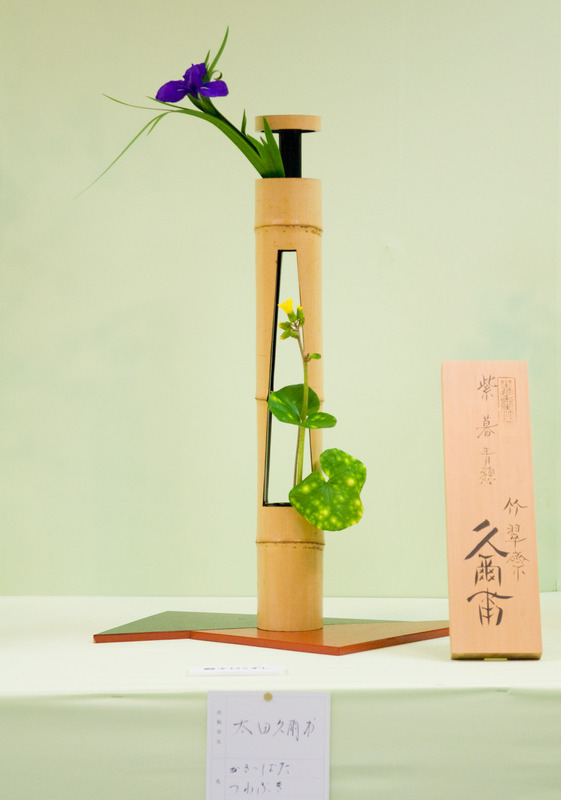 the “Urasenke school of tea ceremony” or “Sogetsu school of ikebana”). However, despite a global outreach, a particular school’s technique should be identical at every chapter where it is taught (“should be” being key words here). I know I said “just a note” at the beginning of this comment, but this is turning into a full-blown intro course. 🙂 My apologies. 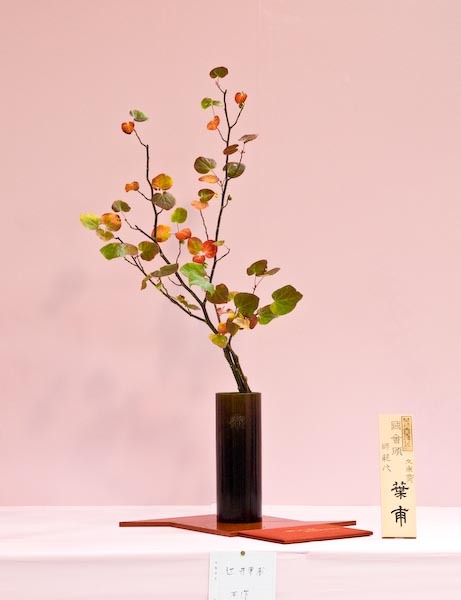 I tend to ramble about Japanese tea ceremony and Ikebana. 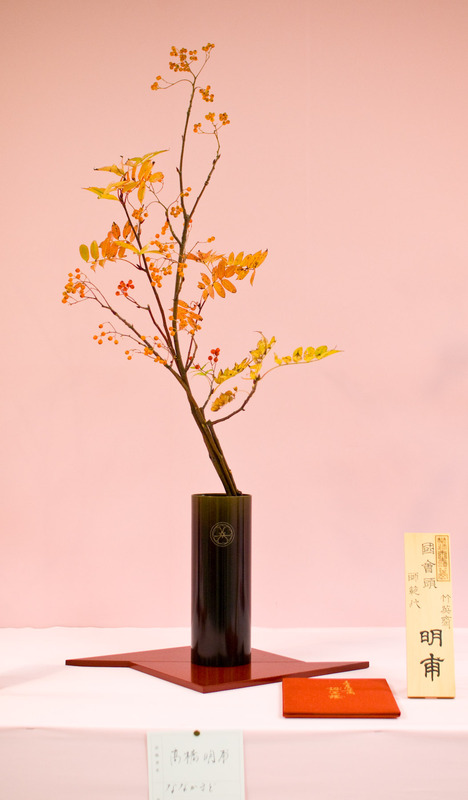 Thank you for posting some wonderful photos of Ikebana being done in Japan!